Diego Martin Central Mp Ken Valley has been rejected as a candidate by the PNM Screening Committee. 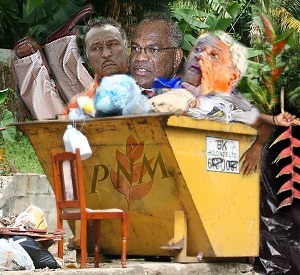 Sources said Prime Minister Patrick Manning in his capacity as Political Leader met with the Screening Committee on Friday evening, shortly after naming the election date and recommended to the Screening Committee that the Diego Martin Central constituency executive be instructed to search for a new nominee(s), from which to select a candidate. The Screening Committee’s decision- that the search continue for nominees — has not yet been communicated to the Diego Martin Central constituency executive. The search for a new candidate therefore has not yet started 33 days before the General Election. However sources said Manning had a candidate already lined up. Sources added that it would not be Foreign Affairs Minister Arnold Piggott, but a political neophite.